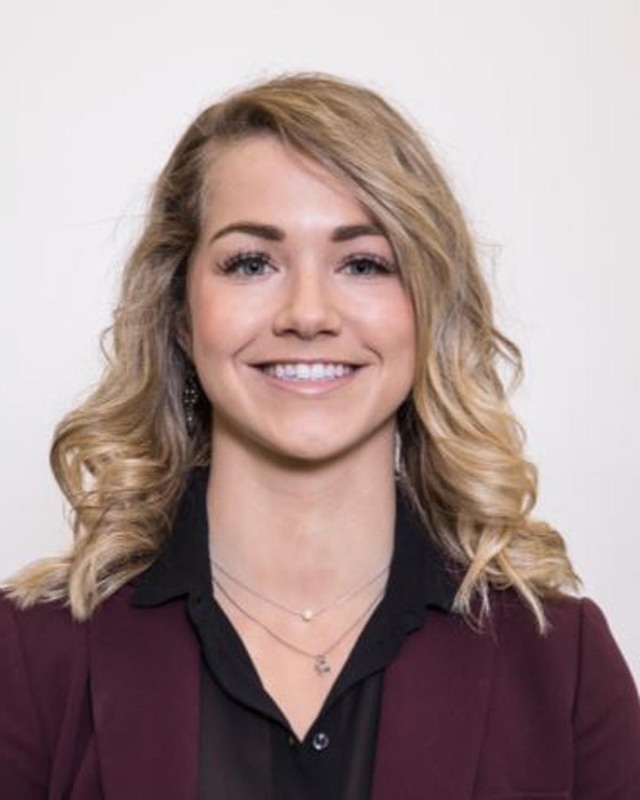 Kristen Lindvall, PA-C began her PA journey with Augsburg after graduating from Gustavus Adolphus College. She completed her PA education in 2012 and then secured a job in general surgery with HealthPartners. Her experience at HealthPartners is characterized as a highly intense surgical practice with an emphasis on complex patient management. She served as a preceptor for many students rotating through their general surgery rotations. 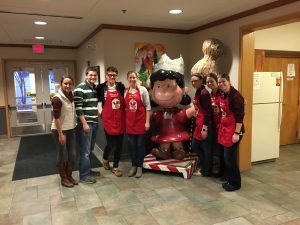 This past fall, Kristen returned to the Augsburg PA Program full time as a Clinical Assistant Professor. 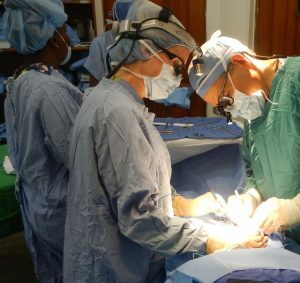 Annually, Kristen travels down to Haiti for surgical mission work and reflected on her most recent trip. This is my 5th year spending a week helping the people of Haiti through surgical mission work. This year, our team performed 82 cases ranging from appendectomy and hernia repairs to C-sections and thyroidectomy.The pathology is advanced, the patients have gracefully suffered while awaiting treatment, and the work is always incredibly rewarding. There have been some recent criticisms of short term mission work. Criticisms have revolved around mission “voluntourism” relating to a lack of cultural understanding and performance of work for personal gain rather than true engagement in a community’s needs. I think healthcare is a great exception to this. We have specific skill sets, skills that are otherwise not present in third world countries, and we can directly impact these people by improving their quality of life immensely. The needs in the developing world can be overwhelming. It can feel impossible to make a dent in the problem. The focus, as always, needs to be on our individual patients and the life changing care we give. Although this is “short term” mission work, the impact on our patients is far from short term. I would challenge everyone to remember why you became or are becoming a PA. Although needs at home certainly exist, consider expanding your practice globally. The need abounds. It will change you as a person and as a provider, you won’t regret it. The Augsburg PA faculty recently welcomed Amanda Perkins onboard as she switches over to a full-time role within the program. With her change over to full time, Amanda will split her time between the academic and clinical phases of the program. Amanda Perkins first joined the Augsburg PA while filling in during a sabbatical. Amanda worked full time as a clinical pharmacist within the Medication Therapy Management (MTM) program at HealthPartners St. Paul Wabasha Clinic. Over the past year, Dr. Perkins has taught the pharmacotherapy course to first year students. When she is not busy in clinic or teaching, Dr. Perkins enjoys reading, traveling and spending time with family and friends. Recently, she welcomed a new addition to her family – a bernedoodle puppy named Lucy. What do you find the most rewarding part of teaching? What piece of advice do you have for PA students? What is one piece of advice do you tell your patients? Please join us in congratulating Dr. Perkins on her new position! 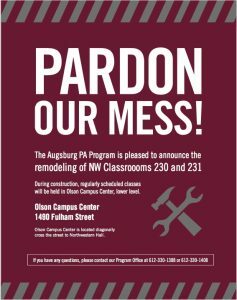 As thousands of students submit their applications for the current CASPA cycle, faculty at Augsburg PA Program have suggestions and reminders to keep in mind! Take their advice to heart as they all have been in your shoes. Do not, under any circumstances, ever refer to a PA as a Physician’s Assistant. My license to practice, NCCPA board certification, and diploma all state “Physician Assistant”. Use of the apostrophe tells admissions committee members that you haven’t done your research. Have several people review the essay portion of your CASPA application as well as any supplemental applications that are program specific. Research the programs you are applying to and know why you are applying for each program. Most people applying to PA school have excellent grades, want to help people, and have some clinical experience. So what is going to make the faculty reviewing your application remember you? Think about: How do you align with the program’s mission? Why do you care? As an interviewer, I ask: As a human being, when I meet you, could I see myself trusting you with my loved ones’ lives? Program Director Alicia Quella graduated from the University of Iowa Physician Program and has worked in PA education for many years. Dr. Quella urges students to be yourself! We don’t want you to say something you think we want to hear. In doing this, be sure you do not copy our mission statement; instead think of how you align with our mission and how you demonstrate it. Professor Eric Barth has been with the Augsburg PA program since 2008 and knows what it takes to get into PA school. He completed his physician assistant training at Trevecca University and University of Nebraska, Omaha. First, all applicants need to understand and articulate that becoming a PA is about providing genuine care for other people. There is no room for selfishness or ego. Secondly, for re-applicants, avoid recycling applications. We all want to know what the you have done to improve your chances over the prior year. In addition, I think it’s a sign of maturity to articulate how it felt to be denied admission the prior year. Last is to always keep moving towards their goal of becoming a PA. Take or retake a class, get more patient care experience, go on a mission trip, job shadow, anything to improve your chances. We wish you the best of luck as you all pursue your PA education! Rachel Gratz, PA-S2, has a lot to celebrate and look forward to in 2019! She recently found out she is one of 19 students being awarded the 2018 Health Professional Scholarship Program (HPSP) from Veterans Affairs. Veterans Affairs gives out the scholarship with the hopes of increasing the supply of PAs within the VA but also for the nation. Across the country, over 800 students applied for education support while also making a commitment to serve for two years as a PA with the VA.
Everyone has their own story to pursuing a career as a PA. For Rachel, she has always been dedicated to doing things for others. From a young age, she was volunteering anywhere she could and even donating her allowance to sponsor a girl in Brazil. Her passion evolved over the years as she worked in nursing homes, hospice care, assisted living and mental health. “The accumulation of these experiences and my degree in Biology ultimately led me on the journey to the PA profession,” says Rachel. As we near the summer semester, second year students in the Class of 2019 are preparing to start their Master’s Projects. This opportunity allows them a choice to pursue a topic of interest to them. They may direct their own research and develop a paper based on a specific research question. The department faculty and staff grew! Vanessa Bester joined us in July as new Associate Director and Assistant Professor. Katelyn Waalen started in August as a clinical lead specialist. Amanda Perkins permanently took over pharmacotherapy this fall and Trent Whitcomb joined our faculty this fall. We were also excited to welcome a new Dean of Professional Studies earlier this spring! Dean Monica Devers oversees the graduate, adult graduate and traditional undergraduate professional studies programs. Before deciding to come to Augsburg, Monica was the first dean at the School of Health and Human Services at St. Cloud State University. She is trained in speech-language pathology and has worked for the University of Minnesota as well as Children’s Hospitals and Clinics of Minnesota. Program Director Alicia Quella won a fellowship through AAPA-PAEA for research on trends with new PA graduates and their job placements. This is the first year of the fellowship and we are excited about what her research will find! Watch the video where Director Quella talks more in-depth about her research. Skye Peltier, an alumnae from class of 2005, won the CARE award from the American Thrombosis and Hemostasis Network. With her award, Skye intends to use the power of real-world data in the ATHNdataset to further research in opioid use in hemophilia patients. Every year our students participate in a wide-range of volunteering activities. Over the course of the year, we clocked 34.5 hours of service. 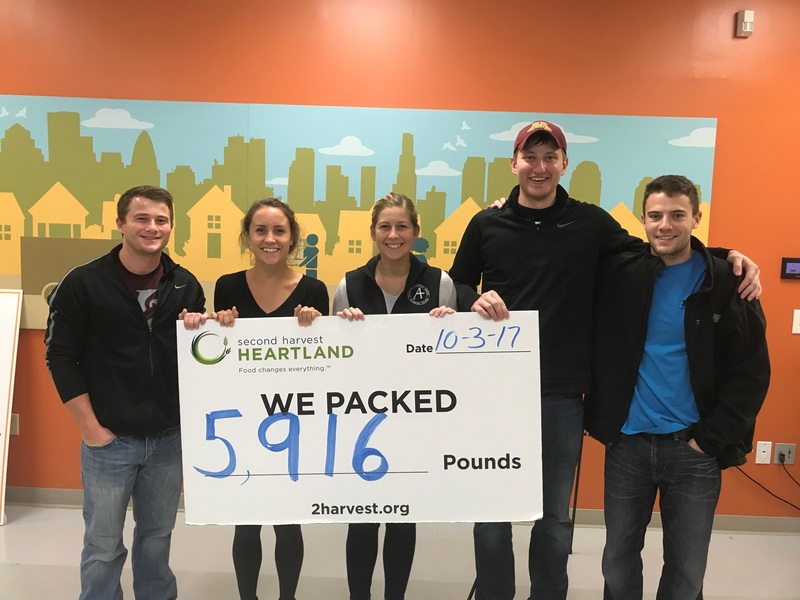 Some of our favorite community partners are Ronald McDonald House, Feed My Starving Children, and Second Harvest Heartland! During PA Week alone, student volunteered almost every day of the week. The PA program partnered with the Augsburg Men’s and Women’s Hockey teams for a stuffed animal toss. A total of 100 stuffed animals were donated to Children’s Hospital in Minneapolis. Augsburg PA students secured the title of Challenge Bowl Champions as well as second place! 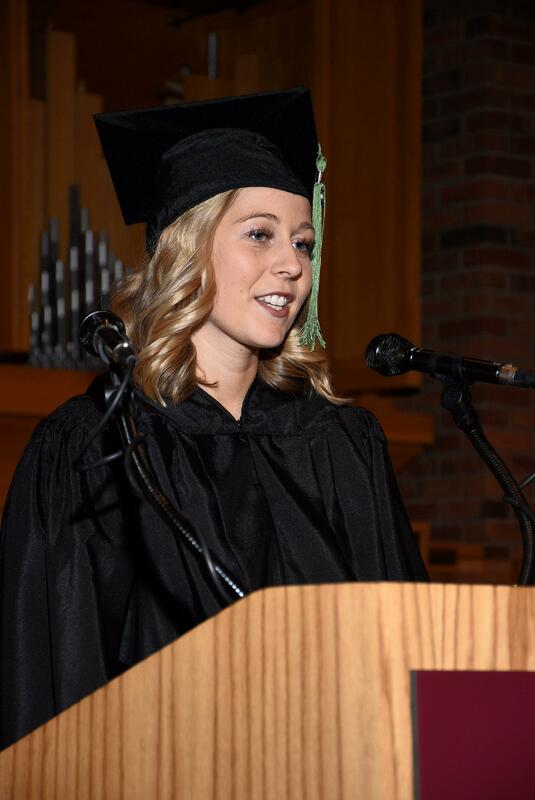 In December, the program held it’s twenty-first commencement ceremony at Hoversten Chapel on Augsburg main campus. Twenty-seven graduates completed their formal training and are now preparing for their certification exams. We can’t wait to see where they go! We will shortly be under-going a remodel of our classrooms and are excited about the new learning environments for our current cohorts and the ones to come. 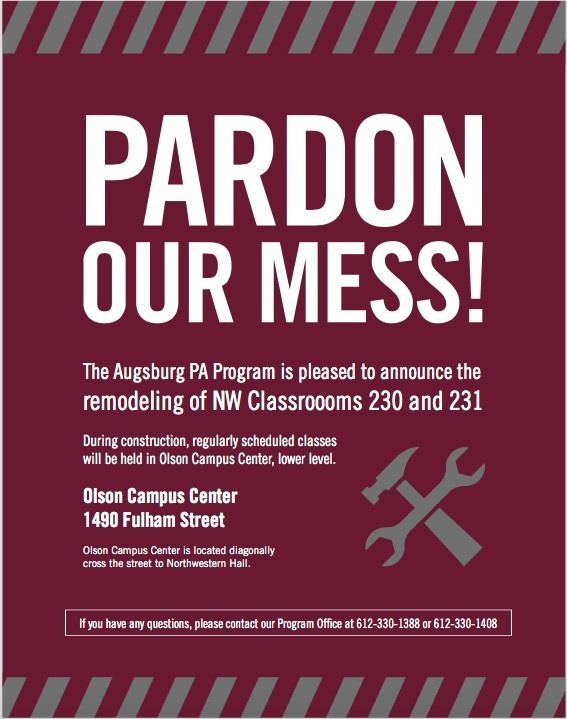 Stay-tuned for more information about our upcoming remodel! On Saturday, December 2nd, students of the twenty-first Master of Physician Assistant Studies class graduated at Hoversten Chapel. These are the first students to graduate under the new Augsburg University name. Our newest alumni join a network of over 500 peers who completed their graduate training at Augsburg. Julia Curry spoke to her fellow graduates about their accomplishments so far and the learning that still lies ahead in their professional career. Lydia Bruenjes presented the Clinical Instructor of the Year award to Richard Burris, PA-C. Mr. Burris has been a long-time preceptor for our program. We are grateful for his many years of partnership and nurturing future PAs. Robert H Carlson, PA-C, was the guest speaker for the twenty-first commencement ceremony. Carlson noted that it was fitting to be speaking at this ceremony as he was chosen as the student speaker for the inaugural commencement ceremony in 1997. He is an alumnus of our program and had wise-words to share with the class. In addition to the MPA students will have at the end of their name, he urged them to add this acronym as well: POEM. P stands for passion, O for open, E for empathy and M for mentor. The staff and faculty congratulate the class of 2017 on this milestone! We are excited to call you a peer. We wish you the best of luck as you prepare for your final certifications and your new chapter as a Physician Assistant.